Ice Air has developed a wide variety of Hi-Spec and ExactFit HVAC Packaged Terminal Air Conditioners to provide superior new construction heating and cooling systems or to replace old installations. Water Source Heat Pumps (WSHP) are combination cooling and heating units which provide efficient room-by-room comfort. Ice Air’s Fan Coil Units (FCUs) provide superior whisper quiet, energy effcient performance. Ice Air’s innovative Hydronic Hybrid Water-Cooled Air Conditioners combine high-efficiency cooling with an advanced hot water coil that provides hydronic heat for an entire room without using the unit’s compressor. Ice Air is a customer-driven company, dedicated to creating innovative solutions to improve efficiency, reduce sound levels, make equipment that fits into unconventional spaces and meet complex specifications and requirements. Residents of this 24-story luxury Manhattan hi-rise were not happy. Sure, the East River views were beautiful, but the temperature within their apartments provided less than optimum comfort. 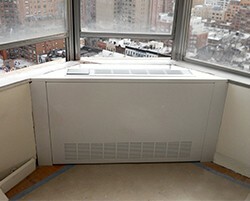 The original thru-wall cooling units – manufactured by IW Corp. in the 1960s – were obsolete and not able to adequately cool the large living rooms of these luxury apartments.